Doris Naomi Force, 96, a loving wife, mother, grandmother and a resident of the Orenco community of Hillsboro, died Thursday morning, April 4, 2019 at the Lake Oswego Hospice House in Lake Oswego. DORIS NAOMI FORCE was born March 1, 1923 in Tacoma, Washington, the daughter of the late Thomas Cartwright and Mabel (Stevens) Cartwright. She was raised and received her elementary education in the Tacoma area and graduated High School from Portland Union Academy class of 1940. She then attended Walla Walla College for two years. She was united in marriage to Clifford Clyde Force on September 29, 1946. They celebrated their 62nd Wedding Anniversary in 2008 before Clifford passed. Following their marriage, they resided in several NW locations until 1952 when they purchased a home in Orenco, Oregon where they raised their four children and had resided since. 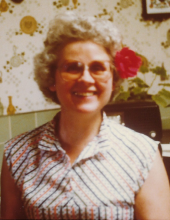 Doris was a homemaker and worked at Tektronix as a tool crib clerk for 20 years. She was a member of the Hillsboro Oregon Seventh Day Adventist church and volunteered for many years in their Community Services program. Among her special interests, she enjoyed her family, home, flowers and faith. Doris was preceded in death by her parents, Thomas Cartwright and Mabel Erhardt, and by her husband Clifford Force. Survivors include her children and their spouses, Michael & Marsha Force of Fair Oaks, CA, Gary & Marirose Force of Durango, CO, Thomas & Carolyn Force of Tigard, OR and Greg & Kathleen (Force) Saunders of Lilongwe, Malawi. Also surviving her are 13 grandchildren with their spouses / partners and 8 great-grandchildren. The family suggests that remembrances may be contributions in the memory of Clifford and Doris Force to Tualatin Valley Academy, 7405 E Main St, Hillsboro, OR 97123 as they have always supported this school. Memorial arrangements are to be determined. To send flowers or a remembrance gift to the family of Doris Force, please visit our Tribute Store. "Email Address" would like to share the life celebration of Doris Force. Click on the "link" to go to share a favorite memory or leave a condolence message for the family.